A new VirtualHome Artificial Intelligence system has been developed to help household robots complete their household chores. 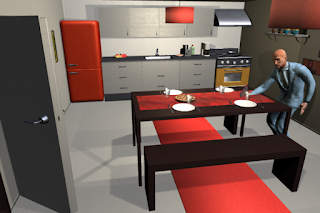 Scientists from the University of Toronto and MIT have developed "VirtualHome". The AI system has virtual agents completing simple household tasks in a simulated environment like a video game. It's the AI-robotic version of the British comedy Bertie and Jeeves and is paving the way for robots to take care of your home. They're training the system using nearly 3000 programs of tasks and interactions such as making coffee along with getting the cup to put it in. The system's AI agent can complete 1000 different tasks and interactions in 8 different locations ranging from the kitchen to home office. The very detailed programs the team is developing can instruct robots to perform the tasks. To accomplish this, the team first collected verbal descriptions of household chores and translated them into code. The team fed the programs into the VirtualHome 3D simulator to be turned into videos. Then a virtual agent performed the task such as turning on a toaster or putting a pot on a stove. The end results: an AI system that trains robots to do household chores and a large data base of those chores in natural language. That's significant because companies developing household robots like Alexa could potentially use the data base to train their robots to do more complex tasks.